We do not work just to get paid, just to finish the 9-5 routine. We want to make a difference, a contribution, a celebration of life, of living. 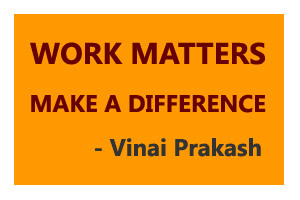 Therefore, work matters! But are you doing your best today? Are you excelling at work? If not, why not. WHY? Today, we are not fighting war with the communists. We may not be working on THE project of a lifetime – The Taj Mahal, The Rocket to Moon, The Scaling of South Pole or The Everest. So therefore, should we do just a mediocre job… just a job to get by? Or should we make any job, any crummy job as THE PROJECT of my Life… and really excel at it. Do you need anyone’s permission to do an excellent job? Will you do an excellent job, a WOW job only when someone’s life or job is at stake? Decide today to do Your Best! Excel at anything and everything you do. Make it the Project of your lifetime! Do such a wonderful job that people will talk about this work ten years from now. Man… those were the days… We worked on THE project of my life. It was such fun, such camaraderie, such great teamwork, such coordination, so much precision, and we pulled it against all odds. Those were the days!!! Do not think of any job as just a job. Make it a WOW project. THE project of your life. Even if it is a small, simple job. Do with with conviction, dedication, do it with perfection. You will enjoy it more. You will be happy. You are not doing it to show off to anyone. But you are doing it to Show it your YOURSELF. You will feel the job satisfaction. You will feel that you are making a difference! And you will be surprised. Others will see it. Notice it. They have no choice. A good quality work gets noticed pretty quickly. Because it is a rarity today. People are so used to seeing the mediocre job, the average job, that when you do an Excellent job, everyone notices… EVERY ONE. Automatically. You do not have to announce it. And even if no one notices, or no one shows that they have noticed…. you don’t care. You are not doing it to please someone else. You are doing it to show to yourself. To take yourself to the next level. But if it matters to you… if it annoys you that no one appreciates your high quality, perhaps it is time to move on to a place where they value great work. It won’t be hard. Great quality work has its own rewards. More recognition, more power, more money, more satisfaction, and more success. You will know it when you do it, and others are bound to notice. Train yourself, and your staff. There are several benefits of training. Invest in your knowledge, and spread the word. Become a Better Person. 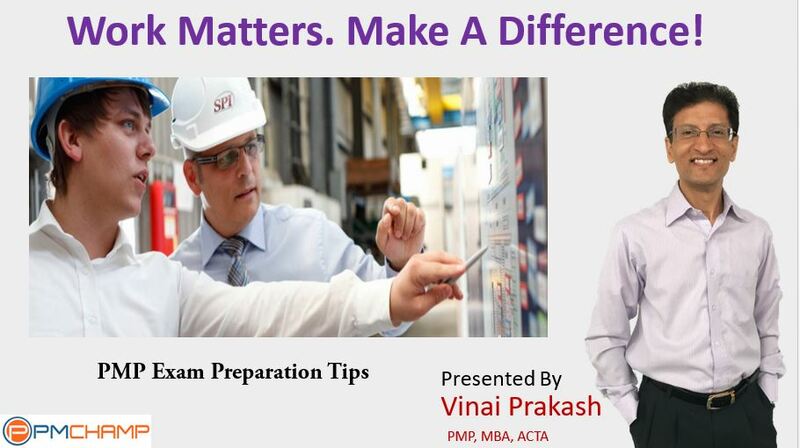 Become a Better Manager. Learn. Share. Contribute! Make it a point from today onwards. Find ways to transform your work… every day work, into a project that matters. Because Work Matters. Your Life Matters. What You Do Matters, and You Matter Too! Write your comments below. Tell me what you think. Does it ring a bell somewhere? Or you simply do not agree with this philosophy. What ever you feel, post a comment, and I’ll be happy to see what you feel, and where you come from. You can also discuss this on our PMCHAMP Facebook group. Thanks. Founder & Principal Trainer at Intellisoft Systems, Singapore. P.S. 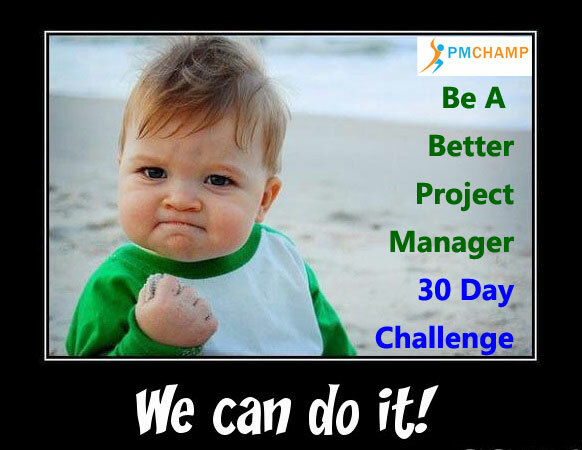 Have you joined the 30 Day Better Project Manager Challenge? What are you waiting for? Today I was busy about pmp questions below I will share tomorrow because just I opened my mail sir. Take your time. You can post on https://www.facebook.com/groups/pmchamp/ when you are ready.